Spruce up your home with this charming cottage styled console table. The hand rubbed and lightly distressed finish brings out an aged, lived-in look while the plinth block legs add a touch of classic craftsmanship that will be adorned by your guests. 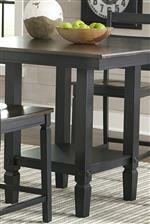 Complete with a lower display shelf, this table will be a great addition to your living space. The Glennwood Cottage Console Table by Intercon at Gallery Furniture in the Oregon, Portland, Clackamas, Washington, Beaverton, Northwest, Vancouver area. Product availability may vary. Contact us for the most current availability on this product. This collection boasts a traditional feel with a touch of artful details that will spruce up any home. This collection includes tables and chairs of different heights as well as table leaves, you won't find it hard to put together the perfect set to match your home and lifestyle. 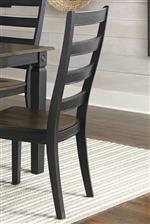 Available in two-toned finishes allows you to match any existing decor or color palette in your dining room. The Glennwood collection is a great option if you are looking for Transitional Cottage furniture in the Oregon, Portland, Clackamas, Washington, Beaverton, Northwest, Vancouver area. Browse other items in the Glennwood collection from Gallery Furniture in the Oregon, Portland, Clackamas, Washington, Beaverton, Northwest, Vancouver area.